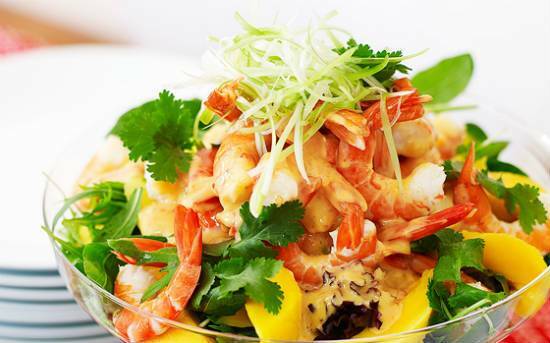 A simple, delicious, healthy and nutritious salad with prawns and mangoes. 1. Cut the mangoes into small pieces, reserving any juice in a bowl. 2. Transfer the chopped pieces to a large bowl. 3. Add the prawns, toss well and keep aside. 4. Mix the mango juice, yogurt, mayonnaise and lemon juice in a bowl. 6. Sprinkle some salt and pepper powder. 8. Arrange the salad leaves on a plate. 9. Add the prawn and mangoes. 10. Pour over the dressing. 11. Garnish with the whole prawns and coriadner leaves. 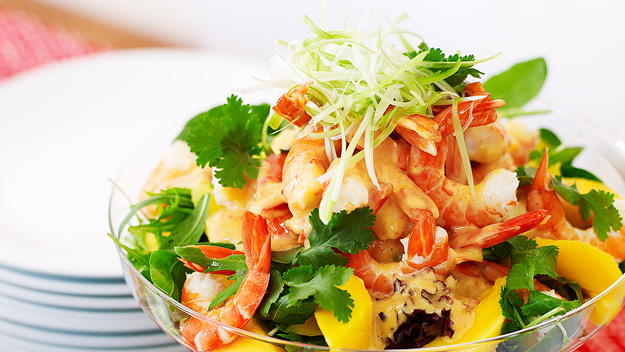 Feel free to comment or share your thoughts on this Prawn and Mango Salad Recipe from Awesome Cuisine.